Citizens’ movements from across the world have taken a stand against this increasingly wide corporate control and monopoly. 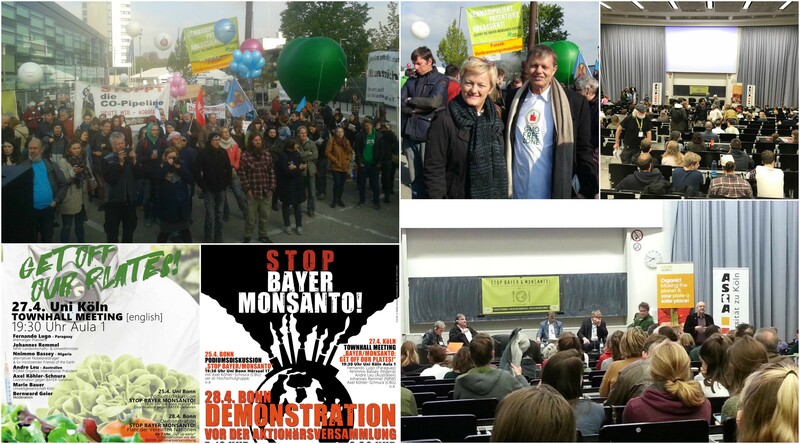 One of the major global events organised by Navdanya International, along with multiple civil society organizations, was the People’s Assembly at the Monsanto Tribunal in The Hague in October 2016, which brought together diverse movements from around the world. The process of holding the Poison Cartel accountable for its crimes is the culmination of 30 years of scientific, legal, social, and political work by movements, concerned citizens and scientists. 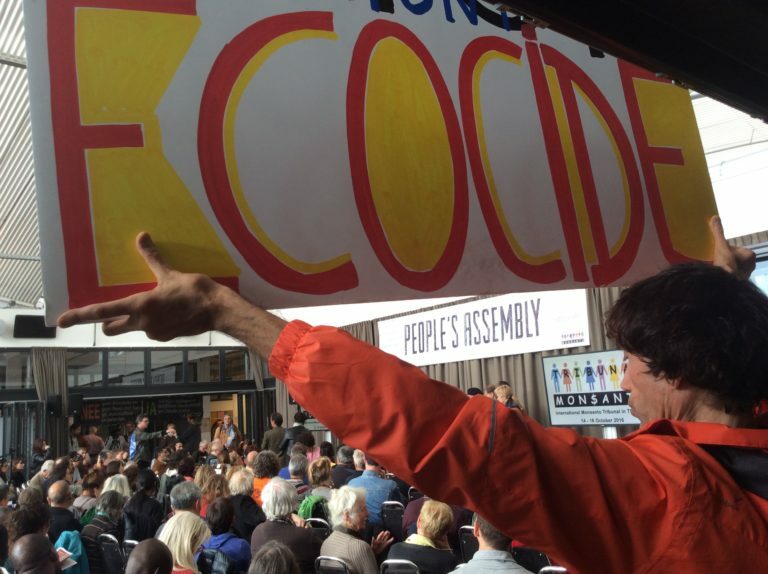 With the movement laying the ground for the tribunal, a parallel People’s Assembly was created to allow for movements from across the world to gather together, sharing problems, political strategies and visions of the future for a sustainable agriculture, which led to the consolidation of a global alliance of organisations, groups and citizens’ movements. The Monsanto Tribunal was a powerful tool in finally bringing the issue of ecocide to the centre of international discourse. It also focused on the widening gap between international human rights law and corporate accountability noting that the legal provisions in place which protect investors’ rights tend to undermine the capacity of nations to maintain policies, laws and practices protecting human and environmental rights. The Judges underscore the need to assert the primacy of international human and environmental rights law in the international legal framework and concluded that urgent action needs to be taken by the UN to avoid that key questions be resolved by private tribunals operating entirely outside the international framework. Furthermore, the Tribunal reiterates that multinational enterprises should be held accountable for their actions and be subjected to the International Criminal Court jurisdiction in cases of infringement of fundamental rights. This global mobilization continued throughout 2017, and Navdanya International organised and co-organised multiple actions with movements across the world converging in a new unity across diversity to end a century of ecocide and genocide. In 2018 a series of actions were co-organised in Germany. 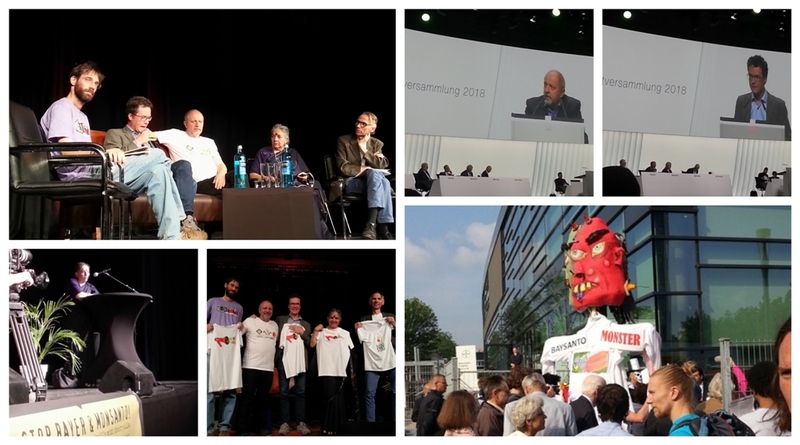 It kicked off in Düsseldorf with the “March Against Monsanto, Bayer & BASF” on May 19 and was followed, in Bonn, on May 24, by a press conference and a panel debate, organised by IFOAM – Organics International in cooperation with the Coalition Against BAYER-Dangers and Navdanya International which included the participation of Dr. Vandana Shiva and Harald Ebner (Bündnis 90 / The Greens), member of the Bundestag – among others. Farmers movements, environmental groups, trade unions and students organizations converged on May 25 at a protest in front of the WCCB building in Bonn, where the annual Bayer’s shareholders’ meeting was held. CSO’s representatives were also able to speak at the meeting inside the building. In November 2018, a panel debate took place in Berlin: Visions for Agriculture 2050, with Vandana Shiva, president of Navdanya International and Norbert Lemken, head of the agriculture politics department of Bayer AG. The heated discussion centered mainly on the opposing views of the speakers. Norbert Lemken defined the discussion as “challenging”. Dr Vandana Shiva stated: “Biodiversity is the web of life, weeds are food and pests are insects, if left in the right balance. The Poison Cartel which began with the extermination of humans in Hitler’s concentration camps, has today brought entire species to extinction. But there is much that we can do as individuals and communities. The defense of life in its vitality and diversity begins with saving one seed, planting one garden”. 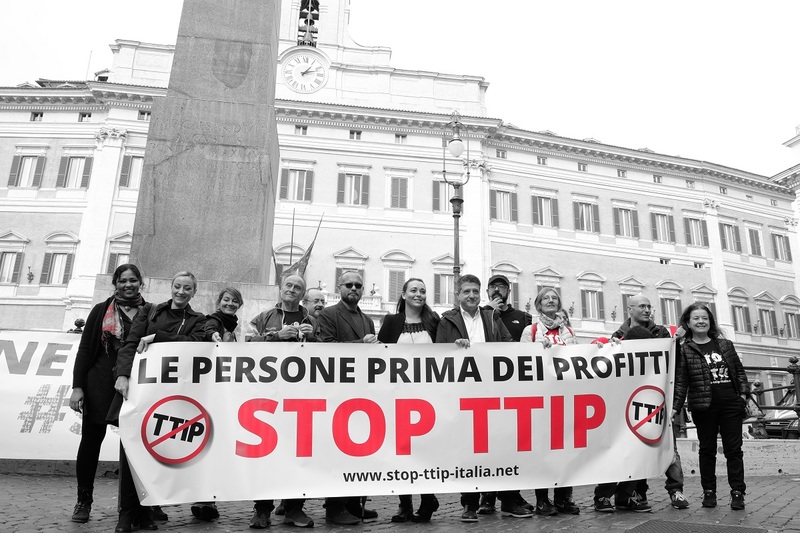 In addition, Navdanya International actively joined the widespread opposition against Free Trade Agreements and worked with the Italian coalition led by Stop TTIP Italia, to put pressure on the Italian government not to ratify CETA (Comprehensive Economic and Trade Agreement between Europe and Canada). Navdanya Organic Slow Food Restaurant and Cafe in Dilli Haat, Delhi, serves traditional Indian dishes sourced from Navdanya’s network of organic farmers. 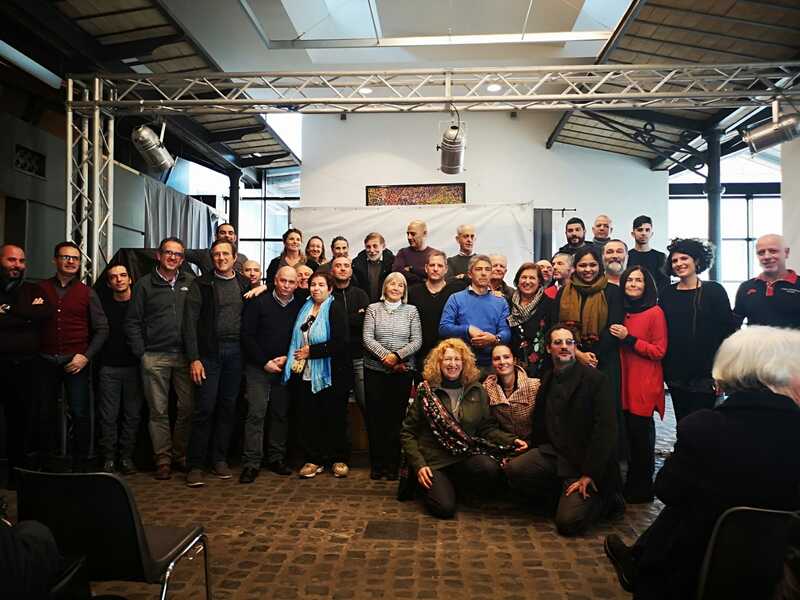 In Italy Navdanya International is working with Regional Movements for creating Local Food Systems and social and inclusive economy networks based on economic democracy. In collaboration with a vibrant and very active network which is progressively consolidating in the area of Rome and Lazio Region, Navdanya International co-organized, in March 2018, a local campaign in support and defence of farmers’ markets, which resulted in fruitful connections with policy makers and representatives of ecological movements. In November 2018, the Cultural Association of Sardinians in Rome (ACRASE, Maria Lai) and Navdanya International organized an event dedicated to the themes: Food and Health (in Sardinian: Mandigu pro sa salude) and protection of Biodiversity. The event hosted debates and a Farmers’ Market where associations, committees and producers from Sardinia and Lazio offered their healthy, local and biodiverse products. 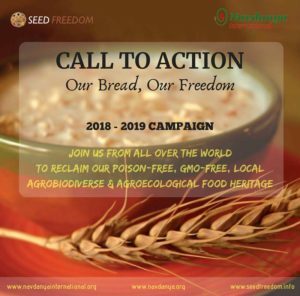 Our International and campaign and Call to Action: Our Bread, Our Freedom links the principles of our Food for Health campaign with biodiversity, agroecology and indigenous food systems. 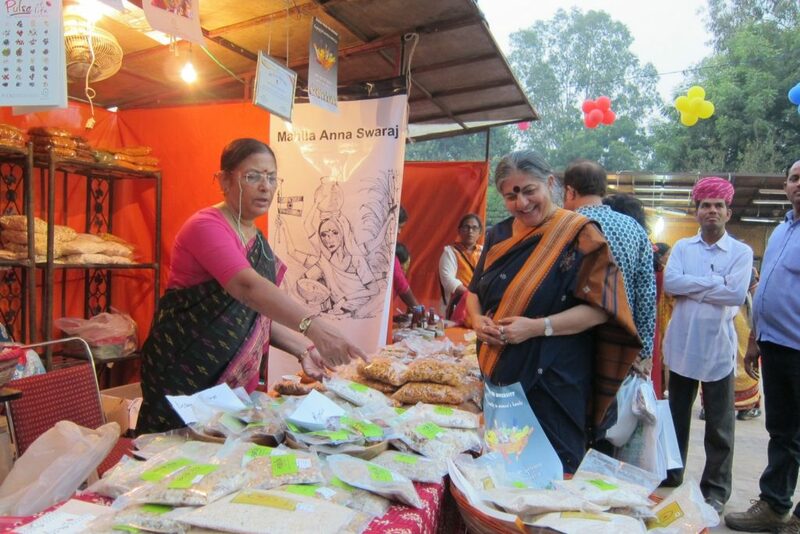 The focus of this campaign is the protection and promotion of traditional diets. We call our traditional diets and dishes our “Breads of Freedom”, which are at the heart of local food systems as the expression of a value chain that works for nature and for the health and dignity of people. They come from the varieties of our indigenous grains and staples, from biodiverse poison-free agriculture, from artisanal processing.